We can’t quite discuss the benefits of a zone control system without first describing what it is and what it does. A zone control system works by directing the output from your heating or cooling systems into the air ducts that service a particular section of your home. This is done with a series of dampers that create specific heating and cooling zones. Each damper can be opened or shut depending on your heating or cooling demands. Each zone can be controlled by its own thermostat or the master thermostat. Your home can have as many different heating and cooling zones as you want. An experienced HVAC technician can help determine how many zones your home will need. The first major advantage of a zone control system is increased energy efficiency. Far too often, homeowners waste tons of energy heating or cooling unoccupied spaces. A zone control system allows you to heat or cool only what you need when you need it, and at the temperature you desire. It can be quite difficult to accommodate the heating or cooling needs of each member of your household. One unique advantage of a zone control system is that it allows you to change the temperature in one room without affecting someone else’s comfort. When your system is energy efficient, it no longer has to work as hard to circulate heated or cooled air throughout your home. This limits the impact that wear and tear can have on your system, lowering the risk of costly repair needs. Certain architectural features such as basements, vaulted ceilings, wall-to-ceiling windows, and lofts can pose challenges for your HVAC systems, making it difficult to evenly heat or cool your home. A zone control system allows you to separate these spaces from other areas of your home in order to heat or cool them effectively. 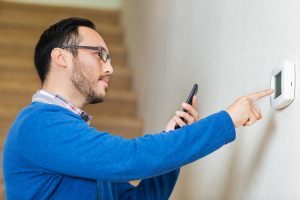 A professional HVAC technician can help you determine whether or not a zone control system is a good choice for your home. Plus, professional installation is key to the successful operation of your new system. To learn more about zone control systems, contact the team at DuAll Heating & Cooling.